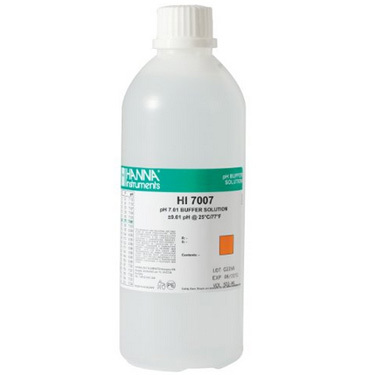 The 7.00 pH calibration solution (Hanna HI7007L shown in picture) is used for doing the higher end of the 2-point calibration of the pH meter. The instructions have you set the meter to calibration mode and you place the end into one solution at a time when prompted. 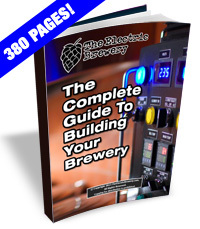 How often you calibrate your pH meter is completely up to you. The instructions say to do it once a month, or every time you use it if high accuracy is required. We do it about every 6 months which is about every 6 batches. After calibration, discard the calibration solution that was used. You cannot re-use it. To limit the amount of calibration solution required, we use our 1mL (1 cc) syringe to fill the area in the black tip where the probe sits when the meter is stored. Make sure to use distilled or RO water to rinse off the pH meter probe and black tip and shake dry between calibration steps. Never touch the ball probe or attempt to dry it with a cloth or any other method that involves touching the probe. A good hard shake (like is done with an old fashioned mercury thermometer) is all that is needed.